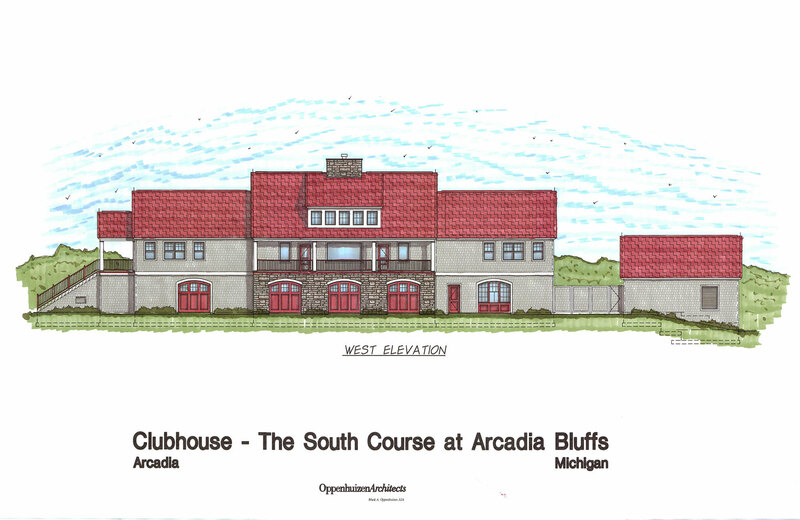 The inspiration for the building of the South Course was born out of a desire to present the guests at Arcadia Bluffs with a golfing experience unlike that of any other golf destination in America. To present players with the opportunity to play a golf course that would stand as a testament to the challenges and emotions experienced only at a few select classic private courses from golf’s earliest days. The objective for the South Course would be to design a golf course by strategically positioning a collection of elements, serene in their appearance, ultimately creating a veil of simplicity over the complexity of the challenges that await. It is this aspect of enduring classic design that both confounds and excites golfers, leaving them with an elevated anticipation to return. Perhaps more than any other of the early American golf course architects, it is the work of CB Macdonald and Seth Raynor, which embodies our desired approach. The objective for the South Course would be to capture the intricacies of their work, not a copy or replica, but an original new course based on the rudimentary principals applied so successfully by these two men. A 311-acre parcel was assembled just one mile south of the existing Arcadia Bluffs course that has enough topographic relief to allow for varying lies, contains sandy soils for firm and fast conditioning, is square in configuration to allow for a well-mixed variety of hole directions, and is walkable. The routing of the South Course is two distinct nine hole loops, each containing a balanced mix of north, south, east and west facing holes. Golfers will notice the distinct lack of trees on the course, making the ever present wind a consideration and affording long range views across the property. The South Course at Arcadia Bluffs is a tribute to a bygone era in golf course design that few golfers today have ever experienced. With a focus on strategy, and the thought provoking use of angles, the goal for this new course is to capture the simplistic nature of the courses from the early days of golf in America. Therefore, we invite everyone to come and experience the challenges, the emotions and the beauty of the South Course – Complexity Veiled by Simplicity. The Clubhouse is scheduled to open late summer 2019 as construction continues throughout the winter months. The 12,000 square foot Nantucket or Shingle Style Clubhouse is located directly behind the 18th green at the turn between the front and back nine, convenient for players to make a quick stop at The Snack Shop as they head to the tenth tee. The three level Clubhouse will offer panoramic views of almost the entire property from the Dining Room and covered outside deck. Similar to the Bluffs Course, a large “tent lawn” area will be located between the 18th green and Clubhouse allowing guests to relax and enjoy a beverage in the signature Arcadia Adirondack chairs while watching players finish theirround. The Snack Shop, located on the lower southwest corner of the Clubhouse, will offer walk-up window service for players at the turn as well provide post round beverage service before finding your seat on the tent lawn. The Dining Room is centrally located on the second level, nearly 20 feet above the ground offering an incredible vista from almost every seat. Featuring a full-service bar in a casual, relaxing atmosphere the South Course menu will feature casually inspired items including Fried Chicken, Prime Rib Quesadilla, and the northern Michigan inspired Beef Pasty. The Dining Room will remain open year-round making it the perfect choice for your private family event, holiday party, or just getting together with friends and family to catch the games during the college and winter sports seasons. Check back for more updates as progress continues and we march toward spring and 2019 season.